Some Trad jazz Not much to say here but again a standard transfer and a quick 30 second restore. I don't get off much on trad jazz, but sometimes i get in the mood and want to hear some. 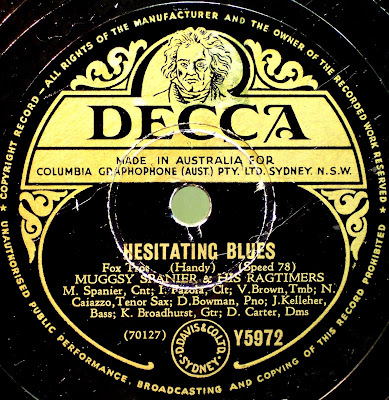 i have heaps of Muggy's 78's because of a Auction sale of 78's when i got heaps of his and other TRAD artists and some that i really wanted. so enjoy the sounds and tell me what you think..
What great music! Sends shivers down my spine. Good work mate, thank you. this is one little joyful little bugger, isn't it? sound issues aside, you really go all out ot restore these with care, and that is highly appreciated by me (and others i suspect). Yeah thats the reason i spent a few years off and on reserching the whole Recording Thing, from reading (1939-1979) Worth of Electronics Australa and Radio and hobbies to get a technical grounding in the field to years of perfecting the "one" true Pre-Amp. Glad someone likes the work! !